After casually assuming the challenge of a marathon 6 months ago – during my phrase of being a yes man – the day finally came around to run 26.2 miles. Can I first say, this was one hell of a commitment. As a guy who had never attempted any kind of distance, trying to complete 15 miles a week quickly became a chore. 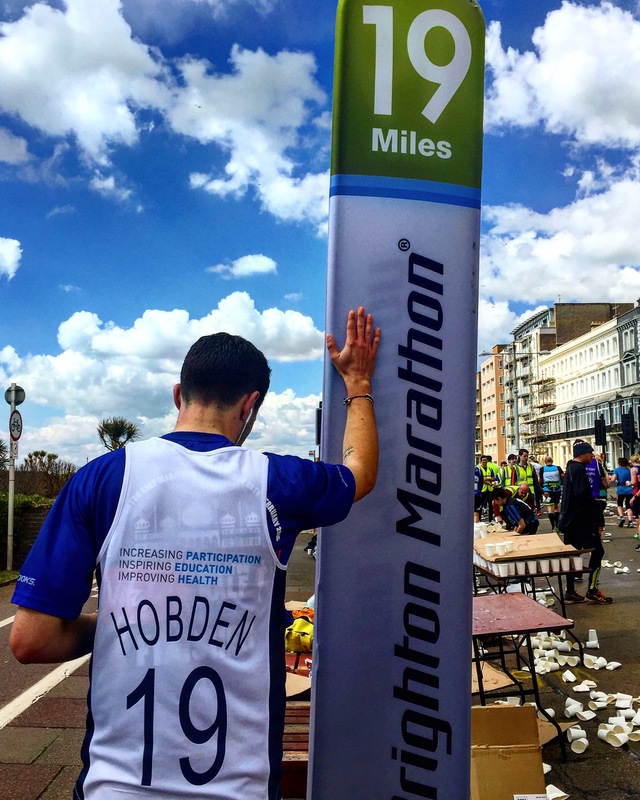 We’ve all heard the story, do one marathon and you catch ‘the bug’… Well, I didn’t. Not even in the slightest. Apparently, it’s not that contagious. Don’t get me wrong, going out for a quick half hour to an hour jog, that’s really nice… A great chance to clear your head whilst getting a bit of exercise. When I had to start running 10 miles and upwards, my body just did not agree. First, the knees –dodgy at the best of times, yet alone without the relentless pounding onto concrete. Then, the shin splints – Christ, if you’ve ever had this, you’ll know what I mean and won’t need me to elaborate. For those who haven’t – consider yourselves lucky. Finally, the mind – The boredom and constant plea with my body to stop running was often my most painful injury – the hardest to prevent and sooth. It’s said you should get up to about 20 miles distance in your training, ahead of the big day. Well, I got nowhere near this distance – 14 miles was my best effort. Fail to prepare, prepare to fail. I started the day with my new trainers on, my new vest, and with a sense of optimism. This was only enhanced as David Bowie – Heroes was played minutes before the start of the race, which then I quickly added to my running playlist. I was inspired and ready to smash it. The first 13 miles, whilst hot, I found easy. I had run this far and was used to the distance. I really enjoyed the experience. You’re told before the race you’ll hit ‘The Wall’… around 20 miles, a part of the race where you feel you can give no more. I didn’t hit The Wall. I smashed into The Wall face first, and got flattened like a pancake upon impact. I had nothing left to give. Every muscle in my leg got attacked by cramp. I’d try and stretch one out, for the opposite muscle to cramp. Like a game of whack a mole that you can’t win, and except it wasn’t a game. It wasn’t fun. It was a pain unlike any pain I’ve had before. What comes with pain and exhaustion, is the mind playing tricks on you. With a rough goal of trying to finish under 5 hours, as I was cramping, I was convinced I had messed up and was on for a 6 hour time. I was gutted and convinced I’d failed. It only took my work colleague Lisa, who was there for the final stretch to give me some motivating words, as I was on the edge of breaking down, to keep me going. I’d accepted every sweet, drink, gel, biscuit along the way but it was half a mile from the end, where I saw my good friends, Jake and Holly, who were there with my favourite chocolate Minstrels, that I knew “this is the last of the on route treats” and I was metres away from finishing. I shoved the minstrels in my mouth in the least polite fashion. I then continued with my walking pace jog and lapped up the applauds to the finish line. The exhaustion brought tears to my eyes. I have no idea why, I had finished and there was nothing to be emotional about. Perhaps tears of joy? It was over – 6 months of training for this moment. It was brilliant. I didn’t get the bug, and I couldn’t walk for a good week after finishing. 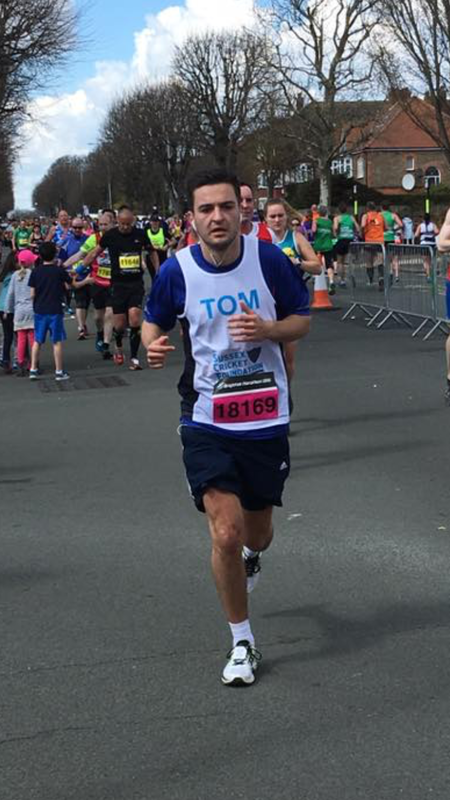 After promising myself a few days after I would never do a marathon again, I sat there watching the London Marathon, and thought ‘Never say never’. There really is something about achieving things that is addictive. My mum told me a good analogy, it’s like giving birth – after the first time a woman will say never again, but 5 years down the line she will sit there with two kids. Pain is temporary. 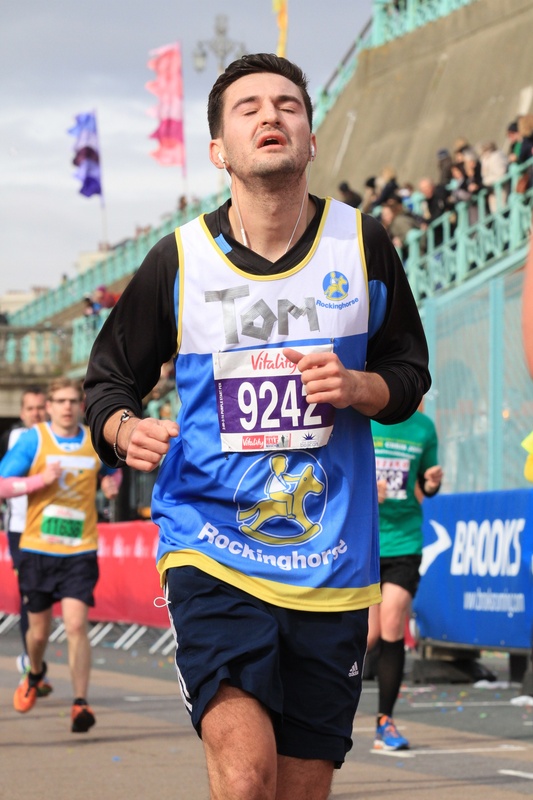 A lot of people told me a lot of different things in the lead up to the marathon. Some true, some not. My advice to anyone doing a marathon, try to ignore the advice. Get yourself a half decent pair of trainers, and work the rest out for yourself, it’s part of the fun. Everyone is a different standard, and it’s not a one size fits all approach – just get out there run. My second piece of advice, don’t do it! The half way point in my current goal to complete a marathon. I made a promise to myself that once I reached the 13.1 mile mark in my training – I would return to posting. So here’s the story so far. 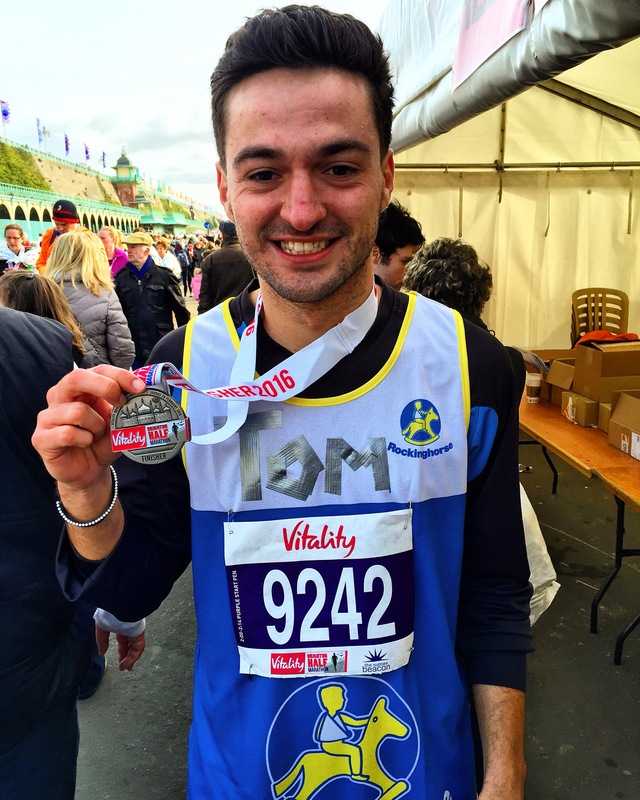 Whilst in full flow of accepting challenges in 2015 – I signed up for the Brighton Marathon. A decision that was made with no real consideration to how much it would impact my life. It’s only since new year, I that I really started to take training semi – seriously. Sunday’s can’t just be hangover days anymore.. they’re meant to be for long runs. I’ve never been a distance runner, in fact, I’ve always despised it. Give me a 100m sprint all day – anything over 200m and I’m struggling. I think prior to starting this challenge the longest I ever ran is 5k – so not a great base to start with. 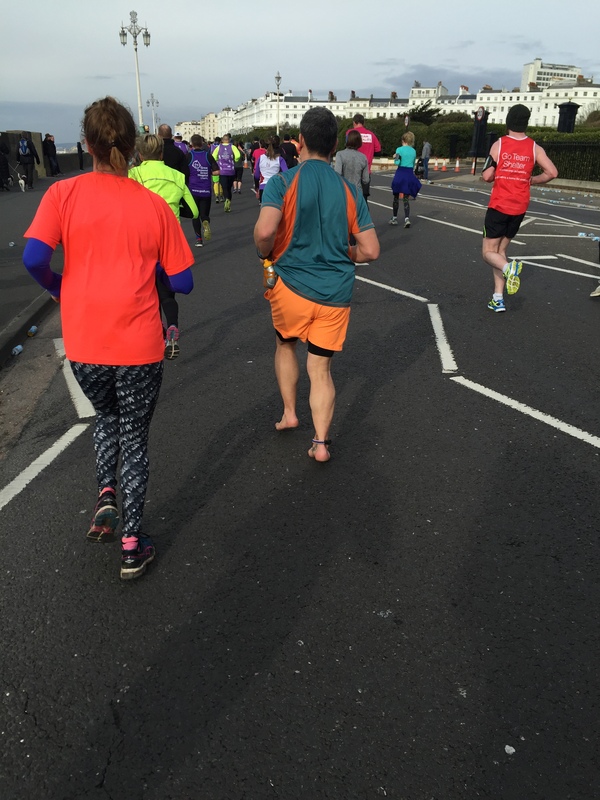 Training has consisted of running three times a week on Brighton seafront, gradually increasing the distance of the run. It’s a frustrating process, some weeks you think you’ve made some real progress, only for your body to tell you ‘no you haven’t’ a week later. Add on the fact, my body doesn’t seem to agree with running. First my knee then my shins – everything seems to be in pain post runs. Having said that, there’s something therapeutically about running – particularly after a stressful day at work. Plug in, listen to your tunes and just free your mind. 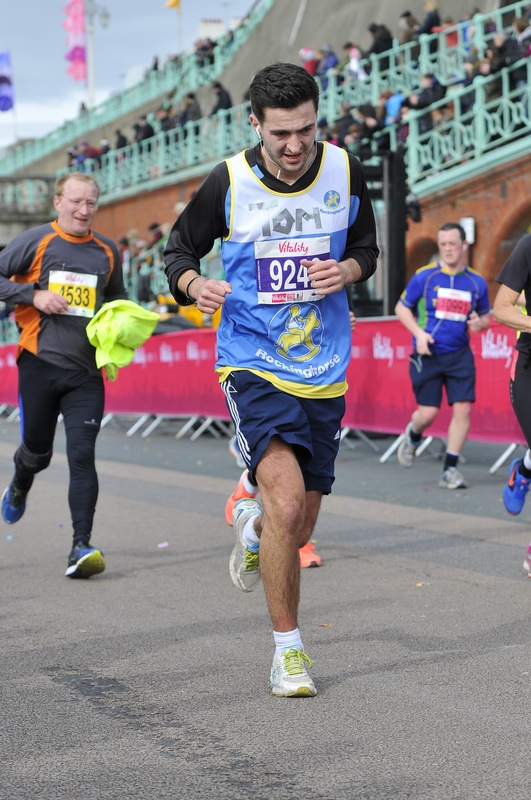 It was my aim to be smashing half marathons well before Brighton half marathon race day came around. However, injuries and illness, for the two weeks lead up to the event I couldn’t really train. The closest I got was an 11 mile run on a Monday evening before my body completely shut down and gave up on running. I was hoping to complete 13 miles on this night, but I crashed. The body had nothing left to give and had to walk myself home, tail between my legs. My preparation didn’t feel quite ideal coming into race day. The 6.30am alarm in order to get my porridge down me was painful but the view walking towards the start line was special. It was a perfect day to run – not too hot, not too windy. 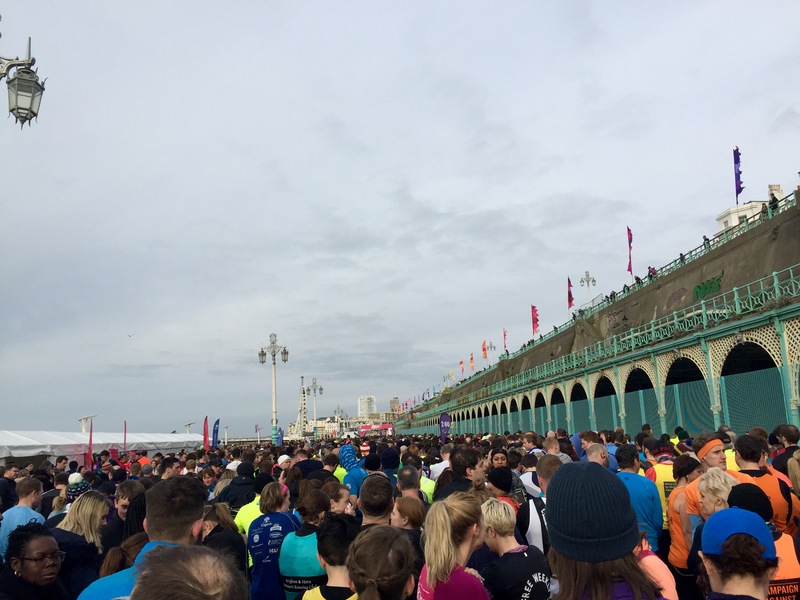 Over 8000 people turned up to the start line – way more than I ever imagined. All the runners filled the waiting time by doing their stretches, jogging on the spot, looking the part. I try to join in at this point, and act like I knew what I was doing. There’s only so many times you can stretch your quads though. 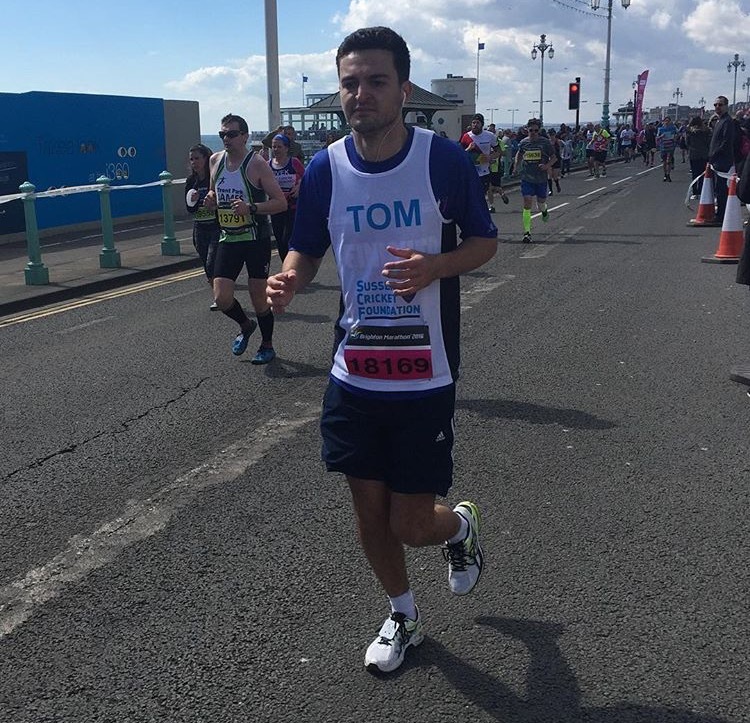 The run itself started off feeling quite easy – the atmosphere of the day and nervous energy seemed to make the first few miles feel comfortable. I ran past a gentleman, running without shoes on and thought now there’s a challenge! I don’t know how this man got on, but he was cruising at the 5 mile point, fair play to him. I wanted to complete the run without stopping or walking, so I would find myself just getting into a zone where I would just be looking down on the road just concentrating on each step. In this zone, I became completely unaware of the crowd supporting me, no idea what song I was listening too and not really sure if I was thinking about anything! The 11 mile point came along. Where in training I had previously failed. At this point, I was no longer in the zone. I was exhausted – using every little boost from the crowd to pick me up. 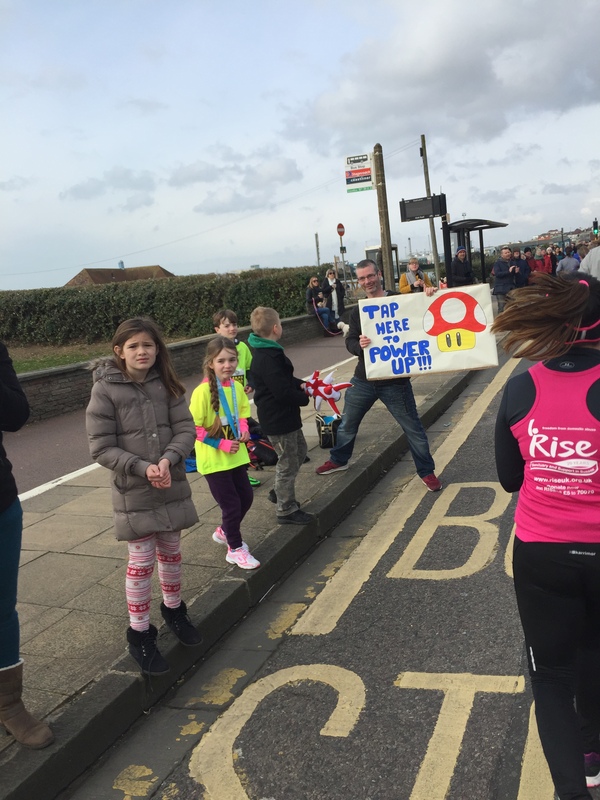 Touching signs for energy, taking sweets of strangers for sugar and shouting at my legs to keep running (followed by a few laughs by runners around me). It was hard by this point. But as I jogged towards the Brighton i360, I noticed the time I was doing. I didn’t really care what time I finished in, but at the 12 mile mark my running app told me I was at 1 hour 51 minutes. At this point, I did start to care what time I finished in. Could I finish under 2 hours? Could I run an 8 minute mile? No. 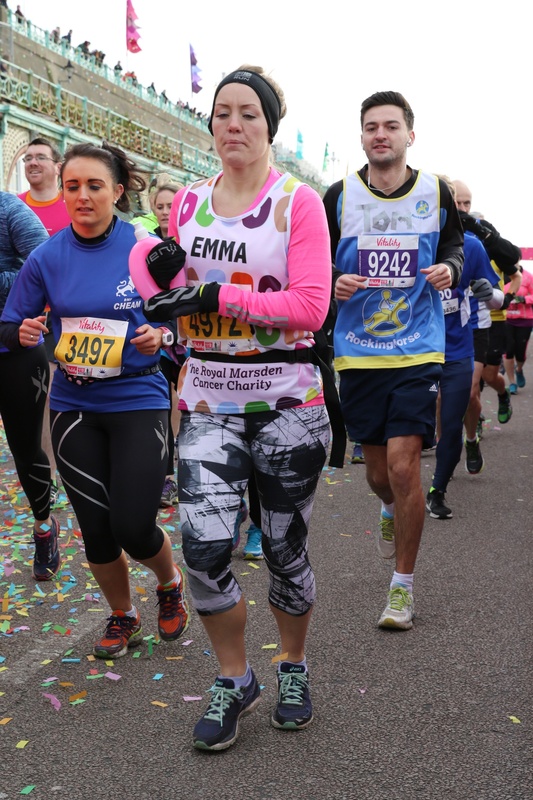 My jelly legs had nothing left in them and my face was pulling all sorts of expressions. The crowd cheering made it possible to get to the end and the feeling at the finish line was an emotional relief. 2 hours 1 minute and 16 seconds. A time in hindsight, I’m very happy with. At this point, the thought of running double the distance is terrifying. Two days later, at the time of writing this post, I can’t walk down a set of stairs without a gasp of pain coming from my mouth. Half way point – It all gets harder from here. I’ll report back in April. In the words of Dory from Finding Nemo – Just keep swimming. Or running in this case. 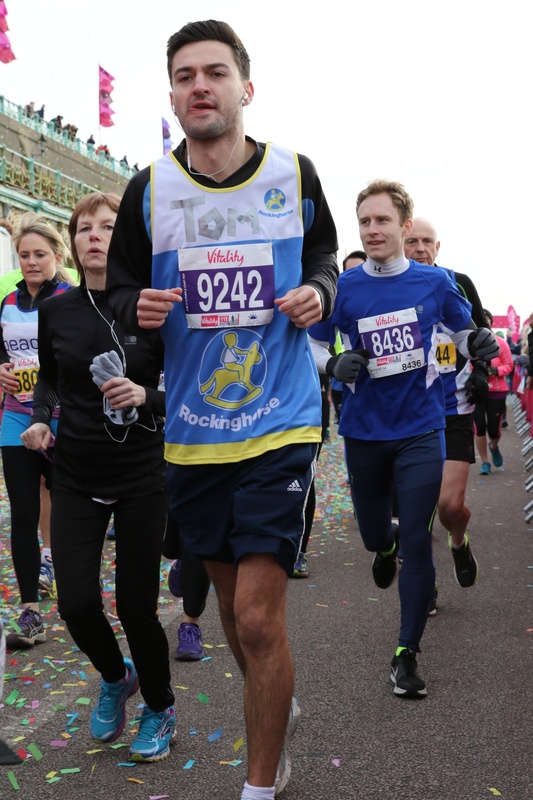 I must thank Rockinghorse Children’s Charity for letting me represent them in the race, and for the free killer post-race massage. 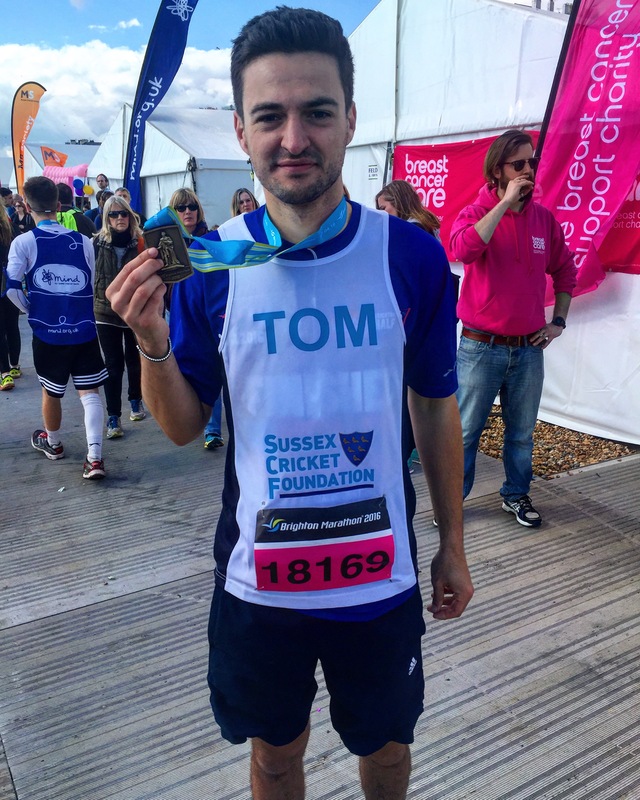 They’re still looking for runners for the Brighton Marathon, so feel free to join me and represent a good cause. A shout out to Rachael Phelps – alarm clock, baggage holder, general support and putting up with my post-race moaning – Much appreciated.